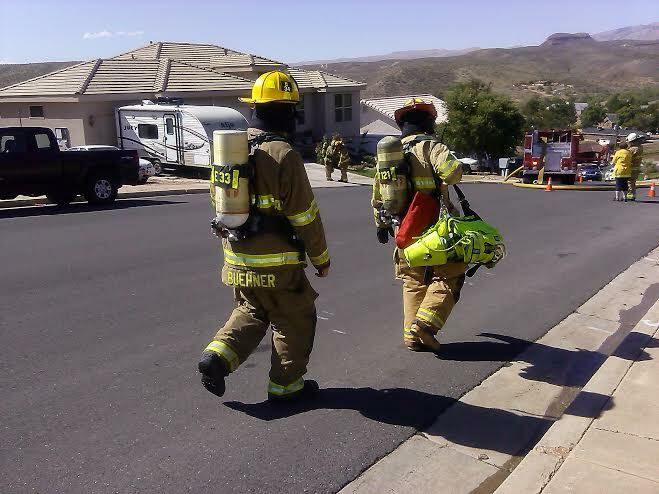 SANTA CLARA — Santa Clara, Ivins and St. George firefighters extinguished a house fire Wednesday that caused approximately $40,000 in damage and left three people temporarily displaced. Just before 11 a.m., Ryan Moss, 23, was just coming home to get some work supplies when he noticed a tannish smoke coming from the roof of his neighbors’ house, located at 1434 N. Santa Clara Drive in Santa Clara. Homeowners Kerry Coop and Trish Coop and their son were not home at the time. One engine from Santa Clara, an engine from St. George, a ladder truck and ambulance from Ivins, and 18 firefighters responded to the scene. Upon arrival, the firefighters could see white, wispy smoke coming out of the roof vents. They entered through the front door and found heavy smoke about waist-high on the main floor, Santa Clara Fire Chief Dan Nelson said. 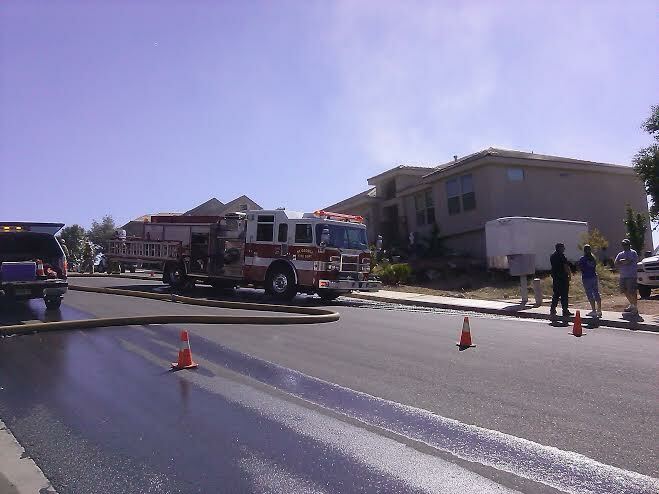 Firefighters utilized an attack line to spray the fire and used fans to evacuate the smoke. 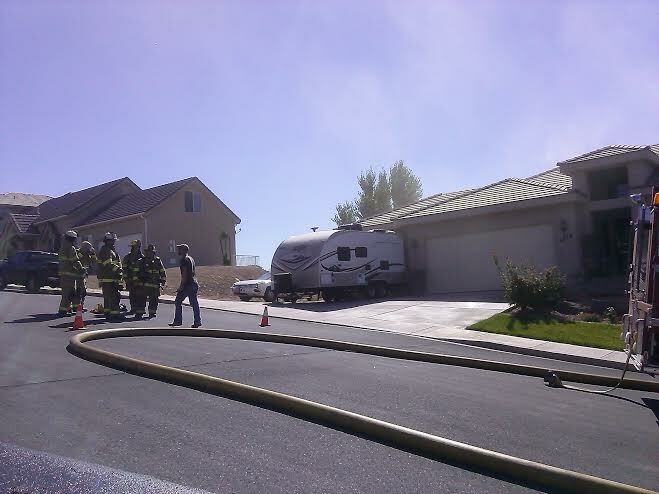 The fire appears to have been a kitchen fire, but the exact cause is still under investigation. The Coops will be temporarily displaced, Nelson said. Tannish smoke? Is that tan-in-a-can flammable? Didn’t read that do not apply on burning bosoms warning label? BTW, who wrote this grade school grammar article and could Little Deuce Coop and Chicken Coop not be reached for comment? That house is just a few blocks from where I live, I hope that there was not too much damage because that is a really nice looking home but at least nobody got injured or killed. That was our thought exactly, no one was hurt, thanks for your nice comment! Life does go on! Huh? Since when is just before 11 am in the afternoon? Fair point, Doug. “Afternoon” has been stricken. Always unplug your toaster when your done with it. Never heard that one before. Can you explain pls? Most toasters have a spring in it that wears down. It’s hardly noticeable , but they can turn on at anytime. The crumb catcher at the bottom is most likely always full because most people never clean them. That is the fuel for the fire. It happens more than you think. That was our thought exactly, no one was hurt, thanks for your nice comment! Life does go on! Thanks to Ashley, she was very caring and professional during her interview.